The R'sonists finally managed to chalk up their first win of the season as the defeated Buxton 3-0 at Rossington. A makeshift R'sonists side aided by a number of last minute additions manage to hold off the challenge of the Derbyshire lads and get some much needed points on the board. Further details can be found on the current season page. The R'sonists third outing of the season saw them held at home by Sheffield United InterBlades in a ten goal thriller at Rossington. Donny had to work hard to avoid defeat for the first time this season, coming from behidn to secure a second point. Further details will be available on the Current Season page in time. An eagerly awaited second game of the season for the R'sonists unfortunately brought the side a second defeat as they were beaten at home by South Yorkshire neighbours Barnsley. The lads from across the county had kindly stepped in after Coventry pulled out of the fixture scheduled for this date, and they continued to help themselves to three points on the Keepmoat astro as the R'sonists faded late on. Further details can be found on the Current Season page. Not the best of starts to the 2012-13 season for the R'sonists as they go down to a 7-2 defeat in their first ever 90 minute encounter with Shrewsbury. Up against a side they had only ever faced before at WorldNET the R'sonists were comprehensively beaten, albeit in an enjoyable manner, at Rossington. Match report available in the Current Season section. After 14 years wearing cast-offs and spare parts the R'sonists are delighted to unveil their first new personalised team kits since their formation in 1998. Thanks to Doncaster firm Team Sportswear the R'sonists now have shiny new black Nike shorts and socks to go with hooped home and away shirts. 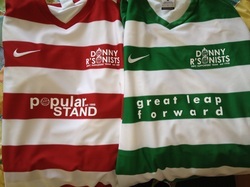 The new red and white hooped home shirt has been sponsored by Rovers' fanzine popular STAND, whilst the green and white hooped away shirts carries the name of band Great Leap Forward on the front and their label Comms Unique on the back. Huge thanks to our sponsors for their generosity in helping make these kits a reality. Sumer season continued for the R'sonists with a home match against Ipswich Punch Drunk FC on the 3G at Rossington CSV. Despite looking in form control for long periods of the game the R'sonists found themselves 2-1 down with quarter of an hour to go. However, a late rally brought an equaliser from the penalty spot, before a goal from Paul Cuffling five minutesfrom time wrapped up a 3-2 win for Donny. A match report from this game can be found on the '2011-12 Season' page. Having discovered who they would face at this year's annual supporters' tournament in Leeds ten days ago, the R'sonists now know the order in which they will ably defend their town's honour. The R'sonists will have to be up bright and early on the Saturday as they kick-off the tournament on Pitch C, with a 9:00am match against Wimbledon 'A'. Their reward for the early start will be a lengthy rest before their second game against a possibly jet-lagged* RC Lens at 1:00pm, before they wrap up the day against Exeter Exiles at 3:40pm. The full schedule for Group 5 can be found below, matches last 30 minutes, the large spacing between fixtures is due to the fact that each pitch plays host to two groups. The R'sonists long overdue return to action sadly ended in defeat at the hands of Grimsby Internet Mariners. Despite taking a 2-0 lead in the first half, the substitute-less R'sonists would tire in the second half allowing their hosts to come back and claim the win, though it took two own goals from the unfortunate Karl Smith to seal victory for the home side. Further details of the game can be found on the '2011-12 Season' page of the website. The draw for the annual international kickabout in a big field in Leeds has taken place today. This year's tournament features 40 supporters' football teams in the main draw, with a further 16 sides in the 'Veterans' tournament for over 35s. The Donny R'sonists have been draw in a cosmopolitan Group 5 alongside Afc Wimbledon 'A', Exeter Exiles and Racing Club Lens. The format for the tournament is of group stages on the Saturday, with knock-out on the Sunday. In the main competition the top side from each group, plus the two best runners-up will progress to the main Cup tournament, whilst the remaining eight runners-up will play-off for the chance to join them via preliminary round. The eight third place teams plus the oxymoronic two best fourth placed sides will progress to the Plate, and the remaining eight 4th placed sides will play off to join them. The tournament takes place on the weekend of the 21st/22nd July and the group draws in full can be found below. After two months kicking their heals the R'sonists finally returned to action to take on a team of Brighton Supporters in an non-IFA friendly fixture. In really well-spirited match the R'sonists came from 2-0 down to eventually triumph 4-3 in a fixture which did not see a single foul committed in 90 minutes. A more detailed report can be found on the '2011-12 Season' page of the site. The R'sonists began the New Year with rare early January action and a local derby against the ladss from across the Dearne Valley. Indeed not since an ill-timed IFA Cup trip to West Scotland have the R'sonists seen action so soon after Christmas, but thankfully this match brought more reward that that infamous trip to Ayrshire. A first half Marc Cartlidge goal helped Donny to a 1-1 draw with Barnsley on Rossington Welfare. More details on the match can be found in the '2011-12 Season' section of the site. Unfortunately both potential games with Grimsby have now been postponed. The Mariners have caught FA Cup fever and so will be in Salisbury at the weekend now, whilst the return game on 17th December has been cancelled with the foresight of pre-Christmas funds/post-Black Friday hangover issues. With Watford iFC otherwise engaged with an IFA Cup game against Lingston on 26th November the R'sonists management (well, Glen anyway) have been busy looking for alternate fixtures to see out the year. And they've had some success with a double-header arranged with old foes the Grimsby Internet Mariners Old Skool. The R'sonists will host the Mariners on 3rd December at Rossington, and make the return trip to the sea-side on 17th December. Disappointment for the R'sonists as they lost out away at South Yorkshire IFA rivals for the second time this season. Donny were beaten 3-2 by the Barnsley supporters' side at Carlton Community College. Further details of the game can be found on the '2011-12 Season' page of this site. The R'sonists wrapped up an active October with an emphatic victory at the Ian Wilson Community Sports Village. Facing the Coventry City Supporters' FC for the first time the R'sonists raced to an 8-0 half-time lead, before eventually triumphing 10-1. Further details of the game and goalscorers can be found on the '2011-12 Season' page. The R'sonists third game in successive Saturdays ended in disappointment as they fell to a 3-1 defeat away at local foes the Sheffield United Inter Blades. Donny took the lead, but were pegged back and well beaten by the Sheffield side; further details can be found on the '2011-12 Season' page. The R'sonists played their first home game of the season at Rossington this morning, retiurning to home soil, in the same manner in which they left it before WorldNET, with a win over Grimsby. Today's visitors the Internet Mariners pushed the home side all the way though with the R'sonists eventually triumphing 4-3. Further details can be found on the website's '2011-12 Season' page. After two months biding their time, allowing the other IFA teams a head start the Donny R'sonists finally began their 2011/12 in a first ever meeting with the Peterborough United supporters' side. In a painfully high heat a patched up R'sonists side gave a reasonable account of themselves, eventually succumbing 3-2 to a decent Posh side at the Bushfield Leisure Centre. An enjoyable old school away day was completed with the squad moving on to watch Rovers record a rare away win at London Road, on a proper terrace and everything. Further details of the game can be found on the '2011-12 Season' page. As has become their trademark the R'sonists produced something of a WorldNET performance of two halves in Leeds at the weekend. Excelling with a small squad on Saturday the R'sonists rattled holders Bradford en route to finishing second in their group and progressing to the main Cup competition. However, Sunday was a different and distinctly more hungover matter, with the side losing their 8am kncock-out fixture to West Brom 'B'. Further details of the R'sonists' weekend can be found on the 2010-11 season page, within the Past Seasons section of this site. The fixture schedule for the WorldNET group stages was announced today and it brought good news for the R'sonists, and for the bar owners of Headingley. The R'sonists have been handed something of a lie-in with their first game not scheduled to kick-off until 11am allowing for an extended Friday night curfew in the local ale-houses. It won't be an easy start though as that first game is against reinging champions Bradford. After the Bantams the R'sonists face Ispwich's Punch Drunk FC at 1:40pm and then have just 40 minutes recovery time before finishing against West Ham at 3:00pm. All R'sonists matches will be played on Pitch H.
The draw for the groups stage of the 2011 WorldNET tournament was made at the weekend in a secret location tucked safely away from the world's media. The Donny R'sonists, competing in their 14th consecutive WorldNET have not been handed an easy draw as they get set to line up against current holders Bradford in Group H. Despite their years in the competition Group H also offers the R'sonists their first chance to face the supporters' team of West Ham; one of the more active IFA sides the Hammers are third in the current league table. Last but by no means least amongst Rovers opponents in Group Hare Ipswich side Punch Drunk FC, a regular opponent in recent years. WorldNET 2011 takes place in Leeds on the 23rd/24th July. The R'sonists nothced their largest victory of the season at the Ian Wilson Community Sports Village, defeating Grimsby Old Skool 7-1. A first-half hat-trick from Matt Findlay put the R'sonists in control with a 3-0 lead at the interval. After the break Mark Cartlidge added two excellent lobbed goals either side of a Karl Scott strike, whilst Findlay rounded off the scoring from the penalty spot. A more detailed match report can be found within the Past Seasons section of the site. The R'sonists notched their first away win of the season with a 5-3 victory away at local rivals the Inter Blades. Two goals from Andy Harriman, a brace from Paul Farra and a Matt Smith strike gave the R'sonists all three points, with Smith's goal maintaining his record of scoring in every season of the R'sonists existence. Further deatils are available on the 2010-11 season page. After going four months without a match, the R'sonists returned to action in emphatic style with a 3-1 victory over Barnsley in Rossington. Having rode the luck a little in the opening quarter of Matty Findlay's low drive and a deflected Andy Sheldrake shot put Donny 2-0 up at half-time. After the break Andy Harriman moved outfield and rounded off the R'sonists scoring with a well-place third goal. Barnsley notched a consolation goal in the final minute. A full match report can be found in the 'Past Seasons' section of the site. A disappointing first game of the season for the R'sonists as they went down 4-3 to Kidderminster despite leading with little over five minutes remaining. The visitors had opened the scoringa dn despite and Andy Harriman equaliser, led 2-1 at the break through a controversial penalty. Goals from Andy Sheldrake and a second from Harriman had put the R'sonists ahead in the second half, but two late strikes gave the points to the visitors. A full match report can be found in the 'Past Seasons' section of this site. The Donny R'sonists travelled to Leeds at the weekend to compete in the annual WorldNET supporters' team tournament for the 13th consecutive time. In a tough group the R'sonists struggled to asert themselves on day 1, losing their opener with Bury 'B' before draws with Castlerock and West Brom's Boing FC. This put the R'sonists into the Plate competition on Sunday morning where they overcame AFC Wimbledon on penalties in the 1st round. Sadly though they would not fair as well from the spot in the 2nd round though where they went down 6-5 in a shoot-outwith Dunfermline. A full report can be found in the 'Past Seasons' section of this site. A fantastic end to the season for the Donny R'sonists as they lifted the Cass McLaughlin Shield in Worksop at the weekend. 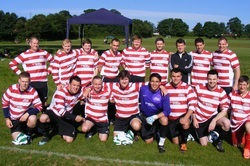 The tournament founded by former Sheffield United Inter Blades player Cass McLaughlin who sadly passed away earlier this year featured six teams, all invited to participate and help raise money for the charity Rainbows, which looks after children and families who have been affected by severe illness and also help families come together in the more serious cases of such illnesses. The R'sonists were delighted to be invited to participate in such a prestigious event, and similarly pleased to achieve a suprise victory in the tournament. A full report can be found in the 'Past Seasons' section of this site. The R'sonsis came from behind on Cantley Park this morning to defeat Grimsby Old Skool 4-3. Trailing 2-0 at half-time the R'sonists finally drew level with goals from Lee Drobac and Andy Sheldrake before Christian Barker put them ahead for the first time in the match. Grimsby levelled once more, but Barker sealed a win for the R'sonists with an excellent second goal in the dying minutes. A more detailed report can be found in the 'Past Seasons' section of this site. Disappointment for the Donny R’sonists as their recent run of form came to an abrupt hand at the hands of the contemporaries from Barnsley. A distinctly lacklustre first-half saw the R'sonists trail 4-0 at the break, and though they rallied in the second half with goals from Greg Sill and Andy Sheldrake, they couldn't make-up the defecit. A full reporet can be found in the 'Past Seasons' sectionof this site.